Like the blacklisted McCarthy-era Hollywood directors that inspired the band's namesake, The Hollywood Ten flaunt a genre-bending style that deviates from the norm and answers to no one. 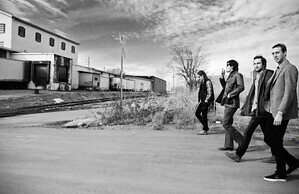 Fronted by the bayou-bred brothers Ford--lead vocalist/guitarist Ben and bassist/guitarist Michael--this Nashville outfit is taking a lead role in the city's burgeoning indie rock scene that is bursting onto the national front with local talents such as the Racontuers, Kings of Leon, and De Novo Dahl. Comparisons and influences are tough to pin down, but visions of Jack White wailing over a filthy, dirty vintage organ at a Cold War Kids concert come to mind rather vivaciously. What started as whisper in the band's humble New Orleans beginnings in 2005, grew to a complete grassroots uproar in Nashville where the Ford brothers met Erik Anderson (keys/bass) and Steve Smith (drums) while studying music business and audio engineering at Belmont University. Establishing one's footing in Music City, USA is not the easiest task, but within a short time The Hollywood Ten built a reputation as a 'must-see' live group. After releasing a series of self-produced recordings, the band has been gearing up to record in early 2009 at the distinguished Oceanway Studios on Music Row in Nashville.